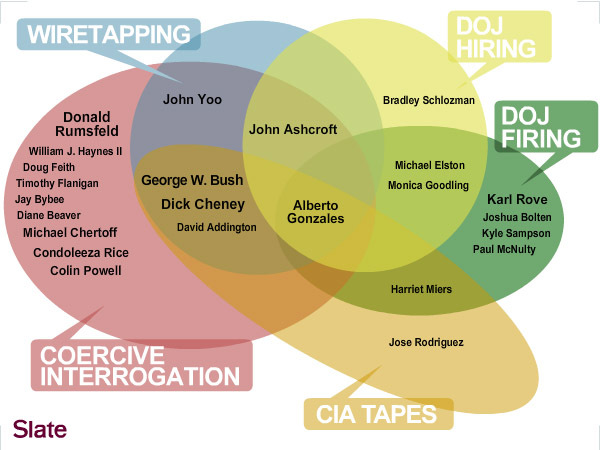 The folks at Slate have been so kind as to put together a Venn Diagram of The crimes committed by the Bush Administration. Oh, where to start? Though you can follow the chart well enough from here, I’d suggest you click on it for the interactive version. It fills one with a strange kind of righteous irritation. All those memos on torture were documented by someone, you know. Karen Greenberg and her colleagues did a lot of research legwork documenting torture in the administration. Meanwhile, Laura Donohue has assembled a great resource detailing loss of civil liberties in the administration’s war on terrorism.